is a 501(c)3 not-for-profit corporation organized to train beekeepers in queen rearing techniques and to facilitate greater value and production of genetically superior cold weather survivor stock, parasitic mite and virus resistant queens. 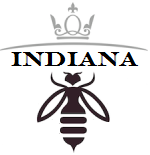 The IQBA provides training and support for accomplished beekeepers to become breeders of high quality genetically superior queen bees and provides newer beekeepers with opportunities to participate in queen breeding through a queen rearing program. Training is focused on practical and proven techniques combined with access to genetically superior survivor breeding stock that thrives in Indiana's cold weather climate, exhibits good honey production, possess a calm temperament and are parasitic mite resistant. Breeders are voting members of the Association that have hands-on grafting experience and commit to annually produce a minimum of 25 queens for IQBA purposes. New breeder queens are made available annually to breeders that report required records and distribution royalties. Rearers purchase stock from Certified Queen Breeders and assist in the raising, mating and distribution of queens. Rearers are encouraged to attend training opportunities and to become queen breeders.